Youth Appreciation Day Run is an organization that holds running competition like 5K running, 10K running, Half-Marathon running and kids running. 5k fun running medals are prepared for those participants. Who wins the competition, who will get the medal. In style, 5K running medals are simple one. 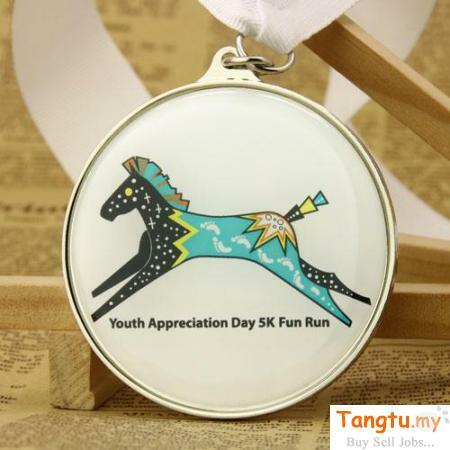 In the middle of 5K Fun Running Medals, there is a jumping horse, which is colorful. It mean that you seems to be a dashing people in the competition and won't give up. 5K Fun Running Medals takes a different craft. It belongs to custom stock-shaped insert medals. Each of them will be poly bagged and attached to a white ribbon. GS-JJ has a large scale of custom medals that can be produced. Race medals and sports medals can also be provided. If you would like to design for your own school, you can choose GS-JJ to produce. Contact us and we will be waiting for you!